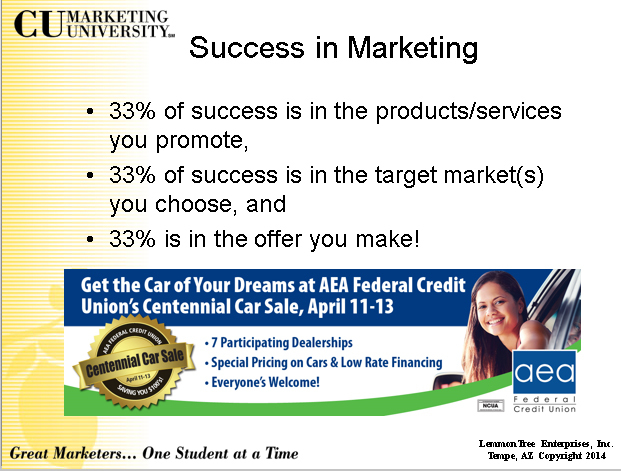 Develop your Strategic Marketing Plan around your credit union's goals and budget. Includes webinars, coaching calls & a one-on-one review of your plan. Learn how to build a tactical marketing plan at your own pace. This program is designed to help you build a marketing plan that is revenue-focused and targeted to maximize budget dollars. The program also provides techniques to measure, track and evaluate the return on your investment of marketing dollars. You get tools, tips and workable solutions that will help you navigate your marketing space to maximize results for your credit union. If you are an executive responsible for marketing or the marketing professional in your organization, this workshop, with four webinars, handouts and worksheets, is designed to give you key tips and tools to stretch your budget.